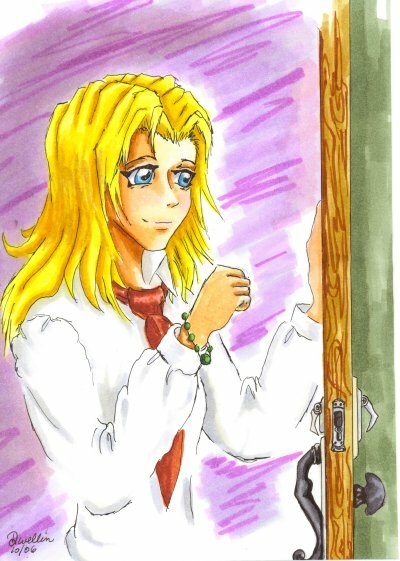 Welcome to Dwellin's B&G and Trigun Fanart pages! Blackfire & Gunsmoke and Trigun Fanart Pages! Welcome Friends and Trigun Enthusiasts, to Dwellin's Ultra-Special Website! This site is devoted to her beautiful artworks and wonderful fanfiction masterpieces!! (Merry Christmas 2005 Susan-chan! Betcha didn't know I had this up my sleeve, did you? --MillyT ^_^). In the links below, you will be lead through the various different stories and fanart galleries that Dwellin has been filling up since she began sending me stories in late 2003! Follow the links to get to Susan's original stories, the Milly & Meryl Collection, then head into the HUGE world of Blackfire & Gunsmoke! The links will take you to the chapters of her story, check out the fanart that she drew for it - plus all of the extras that were drawn by fans of her story, and even fanfiction based on her fanfiction! Then take a peek at her brand new drawings in her personal fan-atic fanart gallery and see even more wonderful Trigun artwork! You won't be disappointed - it's all here - in one handy spot, just for you!! OOooh yes...Check out her BRAND new artworks for Bleach and other topics here: Dwellin@deviantART.com And don't forget to drop Dwellin a line - I'm sure she'd LOVE to hear from you!! Dwellin - just tell her Milly T sent you!! April 30, 2009: After a LONG LONG TIME...I've finally moved this page off the Geocities server...there's bound to be some new stuff you haven't seen in awhile - so check it out! Originals, B&W, Montages, and other story related drawings from authors such as AineofKnockaine's "Forever Mine" (as seen on FF.net)! A Unofficial, Authorized Sequel to "Double Helix"
Trigun and Trigun Maximum are copyrighted by Yasuhiro Nightow, Shonengahosha and Geneon (Pioneer) Entertainment - we do not claim to own the characters, themes or likenesses on this website - we are merely borrowing them for our own amusement. Direct all gripes, complaints, flames to our Gung-ho Gun Department and they will take care of you at their discretion! Direct all questions, comments and hurrahs! to Dwellin or Milly T - we'd love to hear from you!